Other than fashion, one of my other passions is interior design. I love dreaming about my future home, reading design blogs, and watching House Hunters and other HGTV renovation/home buying shows. A recent favorite show of mine is "Property Envy" on Bravo, which I just discovered today and watched a few episodes. The episodes I watched today featured one of the most beautifully styled/decorated homes I've ever seen, and I wanted to share it here. This is an indoor/outdoor foyer with a retractable glass ceiling. 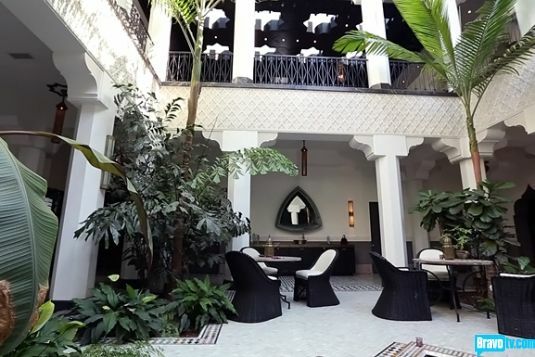 The entire home is covered in moroccan details like you see on the divider between the first and second floors. This is a large living area inside the home - look at the cut out shapes in the ceiling! 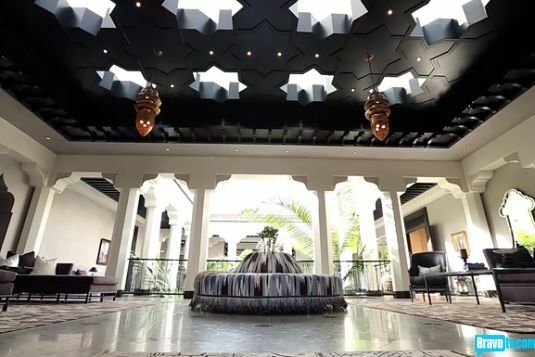 I love the black ceiling itself but the cut out sky lights are so fantastic. This is another living area inside the home. I loved this picture because it showcases the gorgeous black and white marble floor, and the moroccan style window details. I believe this is the master bedroom, but all the bedrooms in the house have this beautiful detailing behind the beds. It's like a headboard, but it's the entire wall! Ugh, I die.